IF PÁDRAIG MCENEANY wasn’t CEO of Celtic Pure, he’d probably be running his own farm-to-fork business. The bottled water company is owned by McEneany and his wife, Pauline, and started up in 2000 in the couple’s garage at home. 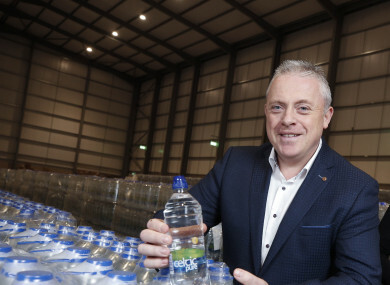 From what began as a door-to-door operation in Monaghan, Celtic Pure water is now available in Tesco, Dunnes and other major retailers around the country. Since 2003, Celtic Pure has gone from four staff to 75 and is projecting a turnover this year of €25 million. In our weekly question-and-answer series, we talked to McEneany about taking a risk on a bottle line and the industry he’d most like to invest in. I’d be working in something in agriculture and producing. I’d possibly have my own butcher’s shop or be producing product from farm to fork. That’s something I’d had an interest in a good few years ago that I was thinking about developing. The first thing I do every morning is check deliveries and then walk the factory floor to check that all the loads went out. I meet the managers and discuss the production on the factory floor. To finish the day, I usually just scan my eye over the sales in terms of orders that came in during the day, what loads are booked in and where things are going the following day. It’s so I can keep my mind fresh on what’s being delivered out to the customers. I think the biggest risk was when I bought my first small bottle line. We were moving from the garage of our house to a greenfield site, and I bought a bottle line that would produce 1,600 bottles an hour. The biggest risk was that I didn’t even know what it was, never mind travelling to China to buy one. It was a very hands-on line – automation didn’t really exist with it. It took me to the next level until I could invest in a more modern line. It was definitely challenging, probably not something I’d recommend. But we needed to do it and it was the best option for us at the time. When you’re running your own business you have to be prepared to basically do anything, especially in the early days. I suppose the one regret I had was that I didn’t continue on education and didn’t go to third-level education. There’s no real work skill that I wish I had. The time they spent in previous jobs. I would look at their CV and when they started out first. Even if they had a part-time job, how early in their life did they start with a part-time job, how long did they stay in it? Then, depending on what job you were hiring for, if they were swapping from job to job very regularly, it would be a no-no to me. I like to see stability in some part of their career. What’s the best piece of advice you ever received and who did it come from? It came from my dad. He would have always said to be brave and never show weakness, and that is something that I try all the time. If you have to make a brave decision on what’s best for the company, you always make that decision. Also, if you’re negotiating a contract, or you’re negotiating to buy machinery, you never show weakness; you always be strong with your decision and carry it through. It was probably creating the whole business and the business model, from starting off in the garage of our house to building a factory facility, investing in machinery and investing in people. It’s all the basic problems that occur from starting a business in the garage of your house. There was no real one problem that I had. Every day, it was monitoring growth and monitoring cash flow. I don’t know the company that I would invest in, but I do know the area. It would be recycling, and producing all PET for the bottling industry. I see sustainability and recycling to be an area of huge growth over the next 10 years and that’s the area I’d be interested in if I were investing in a company. My front sitting room. In the early days when we were bottling from the garage of our house, the front sitting room was regularly used as my workspace. Email “'If you're negotiating a deal, never show weakness - be strong and carry it through'”. Feedback on “'If you're negotiating a deal, never show weakness - be strong and carry it through'”.